Contributing editor Joe Pollack shares some thoughts about his experience opening a cherished bottle for this year’s Open That Bottle Night. One of the great things about opening a bottle of not-so-good wine is that there’s always the opportunity to open another bottle. And so it was when the 1999 BV Georges de la Tour Private Reserve Cabernet Sauvignon turned out to be a clunker. It was raisiny, without much flavor, and what flavor there was, was unpleasant. A week later, ready to try again and hoping for the best, I carefully pulled the cork on the same wine from 2000, its younger brother by a year. I decanted it, let it take a brief pre-prandial nap. I poured it. It was everything the ’99 was not. The aroma burst from the glass, deep, velvety, plummy. It practically filled the room. The deep, dark red color glistened as I swirled the wine in the glass. The taste was rich, perfectly balanced, with tobacco and shoe-leather notes. The finish was long and deep, simply a splendid wine, mature and ready to drink, with more years for it if I’d been lucky enough to have some more. Thinking about it, the 1999 was badly corked, but that happens. 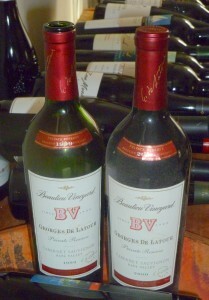 Thankfully, I had the 2000 to keep my memories of that great BV wine alive. We are going to find that many ’99s are raisiny, over the top and not aging well. And that will be true for too many wines in the teny year span from ’97 to 2006. After that, between cooler vintages and the growing dissatisfaction with raisiny wines, the incidence of them is going down. The much maligned ’98 vintage (see Mr. Laube) has turned out to have better balanced wines than either ’97 or ’99. Mr. L. was right, of course, that ’98 was not a great vintage across the board, but its best wines are in balance and that is more important than being bold, ripe and overoaked. Funny…I think someone I know may have a bottle of the 1999. I will have to check it out. I DO love the 2000 and probably am going to get another half case.